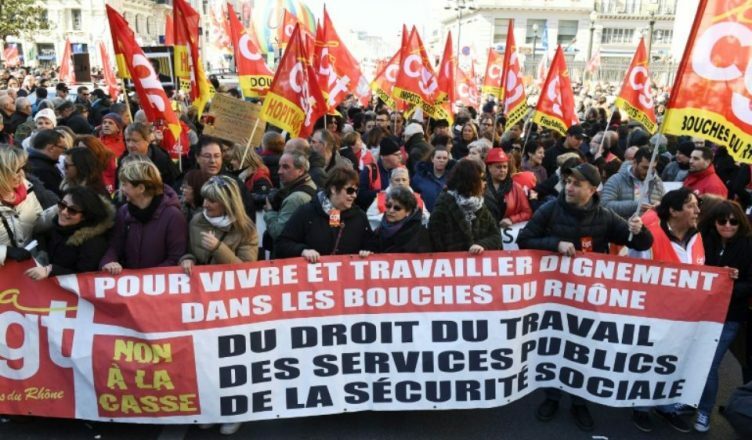 The regime led by President Emmanuel Macron announced in February that it was freezing wages in the public sector, cutting 120,000 jobs, bringing in more contract workers and cutting many budgets. The public sector employs 5 million people in France. The Macron regime also intends to de-nationalise the SNCF, the rail system, with the scrapping of retirement ages of 52 for drivers and 57 for other workers, the ending of assured permanent employment and the scrapping of a standard salary scheme. This brought widespread anger at this increasingly unpopular government. The public sector unions called for strikes and demonstrations on March 22nd. More than a hundred thousand took to the streets. University and high school students also undertook protests to commemorate the founding of the March 22nd Movement, the student group created in May 1968 which had a key role in the May-June events of that year. There were strikes in schools, on the trains, in air transport, libraries, hospitals and other public sector workplaces. Five hundred thousand went out on strike. On the demonstrations there were calls for a general strike. Pensioners joined the striking workers and students. There was street fighting in Paris and Nantes, with the police using tear gas and water cannons. The Macron regime is worried that “all the grievances fuse together, as was the case in 1995” as one government official admitted. Then because of the strength of the movement, the government was forced to withdraw its austerity programme. The union bureaucrats will attempt to defuse the movement. It is up to workers, students and pensioners to escalate the fight against the cuts and to develop alliances and joint action among themselves.